We left Johannesburg again on a Sunday morning however, compared to 3 weeks earlier the temperature had dropped quite a dramatically. As with most of our travel’s we weren’t in any particular rush and we enjoyed the drive south west admiring the beautiful scenery along the way. As we had driven this route a few times before, we knew where we wanted to stop for our breaks. First stop was the Shell garage outside of Ventersdorp in the North West Province. 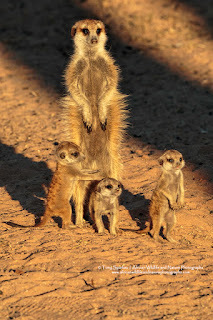 We stopped there on our first trip 3 years ago for coffee and rusks and we note the area has now become even more popular with travellers having their first break when travelling from Johannesburg towards the Kgalagadi. There are now more picnic tables and a friendly ‘on holiday’ feel in the air. Next stop was Vryburg in the North West Province for lunch and we found a great lunch place at the Excel Garage, Mams Food located at the T-junction as you turn towards Vryburg. Not sure why we missed this place before but it was a good find and we will definitely note it for future trips. Not much further to go for our first visit to Red Sands Country Lodge in the Northern Cape, the lodge is located 15km past Kuruman. We’d heard about this place from many people and it was about time we tried it for ourselves. The camping areas are well demarcated and you get your own campsite with ablutions, washing area and if anyone is keen – a satellite dish with a TV plug!!!! We set up camp quite quickly as we felt a cool breeze and we were quite shocked at how quickly the temperature was dropping. Glenda managed to get dinner sorted outside but we had to move our table and chair against the west wall of our ablution block in order to have our dinner outside, sheltered from the now strong wind. Our couple of days were spend exploring the reserve and taking photographs of the bird species that were present. Our two nights at Redsands Country Lodge were a good introduction to the facilities and we would be keen to return in the spring as we were amazed at how many bird species there were considering it was the end of May. Our only complaint about the Lodge is that on a Saturday night the restaurant has live music, which is great for the locals coming to support the place, but as a holidaymaker coming for a bit of peace and quiet this was a little off-putting as the music went on well into Sunday morning. If they had advised us of this when we booked, we could have made arrangements to arrive on the Sunday. After stocking up on provisions at the Kalahari Mall in Upington we got to the Kgalagadi National Park mid-afternoon. We didn’t venture out but took our time setting up camp and chatting to our neighbours about what had been seen that day in the area. After a good night’s sleep we headed out early the following morning after deflating our tyres (due to the fact we were travelling in soft sand) and headed north on the road towards Nossob rest camp. It was great to be back in the Kgalagadi and we absorbed the stark arid scenery of the desert and kept our eyes peeled. 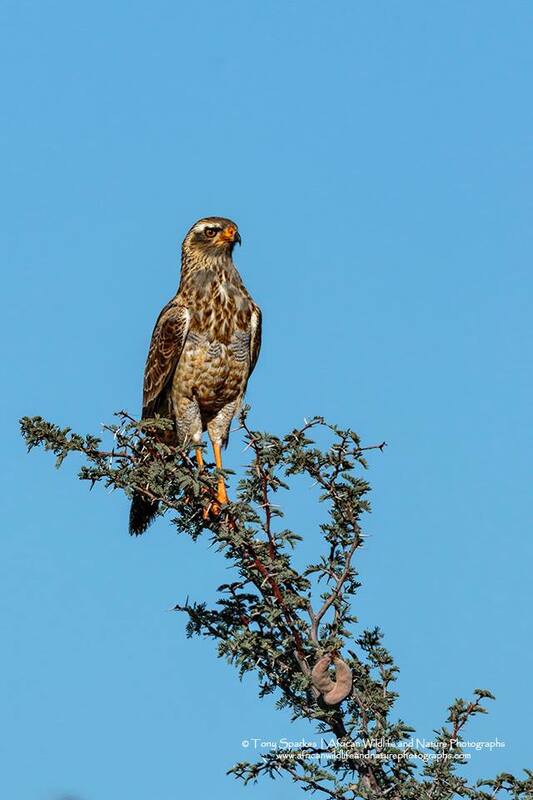 One highlight was a really good sighting of a juvenile Southern Pale Chanting Goshawk (Melierax canorus). 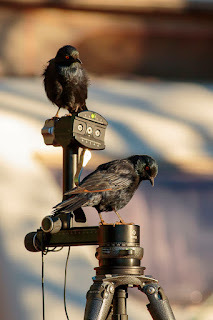 We rate our sightings as good when it is also a good photographic opportunity as often you can see things, which are great to see but to make it good for taking photographs certain other criteria then have to come into play. On our return to camp at lunch time we had a nice sighting of a possible coalition of Cheetahs (Acinonyx jubatus) . They were only a few kilometres from camp and there were 4 of them under a tree, however they were a little far way for any good photographs. We kept an eye out for them the following day but they had moved off and we guess the roaring from Black-maned Lions (Panthera leo bleyenberghi) during the night had something to do with it. The following day was our first venture into the park towing the Bhoma caravan in soft sand, its tyres were also deflated and we set off with thankfully no problems. It handled well in both soft sand and over some serious corrugations. The eggs in the fridge hadn’t even moved and nothing had broken! We arrived at Mata Mata camp in good time after seeing the game you would expect to find in the Kgalagadi National Park viz. Gemsbok (Oryx gazella), Springbok (Antidorcas marsupialis), Blue Wildebeest (Connochaetes taurinus) and Red Hartebeest (Alcelaphus buselaphus) . The camp was a reasonably empty when we got there which gave us the opportunity pick a good site (in our opinion) for our 5 night stay. Looking back, we would say that Mata Mata was one of our favourite campsites of our whole trip. Well spaced out, enough shade or sun for most campers, a pleasant bird hide; well maintained ablutions; a shop with sufficient supplies; petrol/diesel available and pleasant staff. Only small annoyance is the gate times in winter. They are in keeping with some other arid parks but you would have thought Sanparks could be a bit flexible and allow certain camps in their respective parks to alter their opening times according to the sunrise. In June the camp gates open at 7:30 am by which time it is already light. As most photographers prefer to head for the waterholes and the nearest is nearly an hour’s drive away, this means that by the time you get there the early morning golden light has gone. I think this complaint is ignored as I remember discussing this with another photographer and camp management at the Kalahari Tented camp back in 2014 and nothing has changed since then. One of the highlights of camping at Mata Mata was the family of Meerkats (Suricate suricatta) that had their home a few metres from the bird hide. During the day, the family would be out foraging leaving one member as a baby sitter to 3 small pups. They would venture out during the day from their burrow and sun themselves and were really comfortable with the many people coming to photograph them. The camp is also home to many Ground Squirrels (Xerus inauris) which unfortunately have become rather tame over the years probably because campers insist on feeding them in order to get cute photographs of them. They lose their fear of humans and are often around your feet, standing on their hind legs begging for food. We made sure we didn’t leave any titbit out and we still managed to get some photographs. The camp is also a great place for birding and there are resident White-browed Sparrow-Weaver (Plocepasser mahali); Cape Glossy Starling (Lamprotornis nitens); Crimson-breasted Shrike (Laniarius atrococcineus); Familiar Chat (Cercomela familiaris) and Brown-throated Martin (Riparia paludicola) to name a few. Our best bird sightings whilst out and about besides the Southern Pale Chanting Goshawks were many Secretarybirds (Sagittarius serpentarius), Lanner Falcons (Falco biarmicus), plenty of Kori Bustards (Ardeotis kori) and a couple good sightings of the Pygmy Falcon (Polihierax semitorquatus).